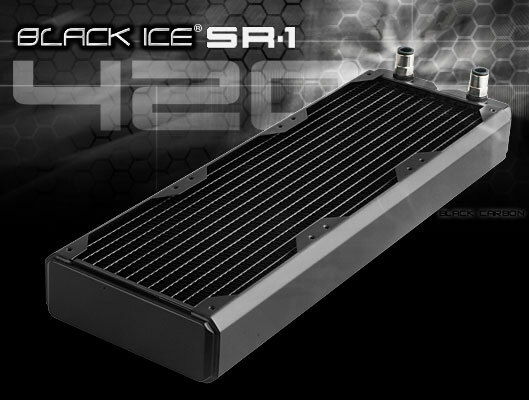 The Black Ice® SR1-420 remains true to its roots in offering case-mod professionals the highest quality triple fan form factor radiator based on Hardware Labs' silent revision platform. The Black Ice® SR1-420 bridges the gap between ultra-stealth and extreme high performance allowing it to effectively utilize sub-1000 rpm fans and scale performance up to 2000rpm. Ultra-stealth operation with increased thermal capacity, and from the industry's standard bearer for quality and craftsmanship. * High performance compact radiator compatible as an upgrade to the Black Ice® Xtreme III, Black Ice® GTX420 and most 3x140mm fan form factor radiators.